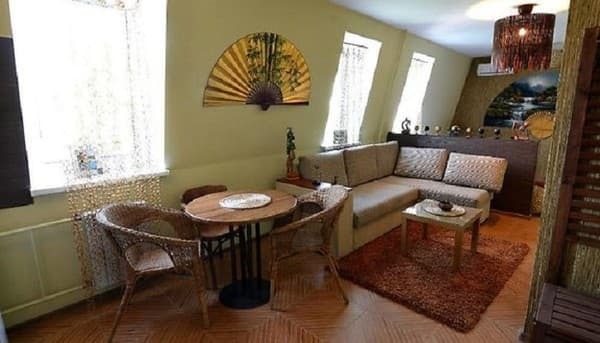 Apartments "Dragomir" are located in the center of the city. Cherkassy, ​​near the Cathedral Square. Each apartment is decorated in an individual design. Guests are offered accommodation in one-bedroom apartments or studio apartments. The apartments are equipped with a large bed, air conditioning, LED TV and dining table. For guests' use, free Wi-Fi, a hairdryer and an iron and ironing board are provided. The kitchen of the Dragomir apartments is equipped with an electric stove, an extractor, a fridge, a microwave, an electric kettle and the necessary utensils. In walking distance, there are many restaurants and cafes, as well as the Central Market is nearby. Dragomir Apartments are located 1.8 km from the city center. Cherkasy, to the railway station 1,9 km. The bus station is 5.7 km, the airport is 6.6 km. Description of the room: Cozy studio apartment. The interior of the apartment is designed in bright, pastel, like burned in the sun tones. The ceiling is decorated with dark contrasting wooden beams, chipped, with the effect of darkening on time. The apartments are equipped with a chest of drawers, wooden chairs, a round dining table and a wrought-iron bed. In the kitchen there is a necessary equipment for cooking and utensils. ATTENTION: check in not later than 20:00. Late arrival is not possible. 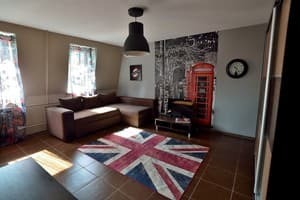 Description of the room: The studio apartments are made with the style of London. The apartment is equipped with a large sofa, on the wall there is a stylish poster with a photo of the night city. The brightest element is the British flag, its colors guests will find almost everywhere. This is a large silk carpet in the middle of the room, and tiles in the dressing room, lamps, paintings and much more. A hairdryer, iron and ironing board are provided for guests' use. The apartment has a fully equipped kitchen. ATTENTION: check in not later than 20:00. Late arrival is not possible. Description of the room: Comfortable apartments in golden-olive, terracotta, brown tones. Furniture has a simple, concise form, a lot of wicker items from rattan. Chandeliers of chandeliers and floor lamps are made of bamboo or woven from grass harnesses. The kitchen gradually turns into a place for rest, and the living room is separated from the bedroom by only a low decorative partition. The apartment is decorated with numerous statuettes, masks, hats and fans, which gives it a special atmosphere. A hairdryer, iron and ironing board are provided. The apartment has a fully equipped bathroom. ATTENTION: check in not later than 20:00. Late arrival is not possible. 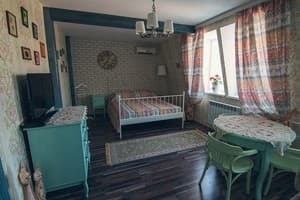 Description of the room: Cozy apartments for newlyweds, made in red and white colors. 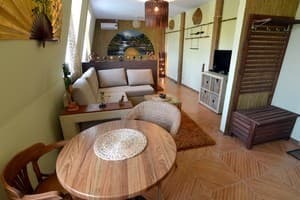 The studio apartment is equipped with a large bed, a round table, a fully equipped kitchen. The apartment has a bathroom in the room. Also, there is a separate bathroom. ATTENTION: check in not later than 20:00. Late arrival is not possible. In the apartment "Dragomir" there is a kitchen for self-cooking. In walking distance are cafes and restaurants. Dragomir Apartments are located 1.8 km from the central Sobornaya Square. The bus station is 5.7 km, to the airport 6.6 km, to the railway station 1.9 km. From the bus station and the railway station can be reached by shuttle # 28.